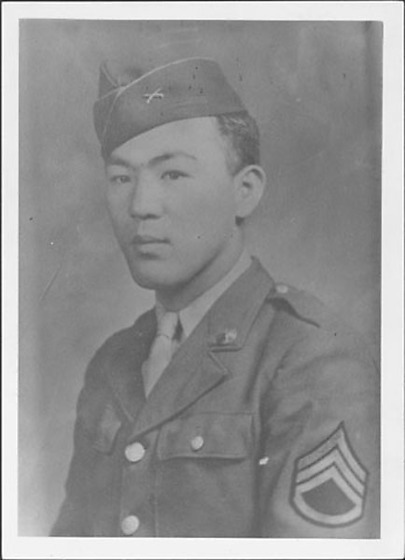 Formal half-portrait of man, Staff Sergeant Shimatsu, in United States Army dress uniform, ca. 1942-1945. Turned slightly to the left, Shimatsu looks to the left of the viewer. He wears a jacket over a light colored shirt and necktie and a garrison cap; Staff Sergeant rank stripes on proper right sleeve and infantry insignia on cap. Smaller image of 97.292.3AA.